The more than 200 types of hibiscus fall roughly into three categories: tropical (Hibiscus rosa-sinensis) commonly called Chinese hibiscus, hardy perennial (Hibiscus m) and shrub (Hibiscus syriacus), which are most commonly called Rose of Sharon or Althea. Plants in the first category, the tropical variety, have glossy, smooth leaves and are most popular in tropic and sub-tropic regions. With care, however, they can be grown in more temperate regions if they overwinter indoors. Sometimes, they will stop blooming or bloom and fade during the summer, but regular water, frequent feeding and abundant sunlight will bring back blooms. Major pruning in very early spring will also encourage lots of new growth and many flowers. Tropical hibiscus can survive cold winters if you bring them indoors. Re-pot your hibiscus in January or February of every other year. Use a slightly bigger pot, trim off badly tangled roots and change out the soil completely. Encourage new growth because hibiscus flowers on this. A root-bound plant will not bloom well. Cut the plant back by 1/3 to 1/2 in very early spring. Gradually introduce more water and sunlight if it has been indoors. Place the plant outdoors in late April in a location that receives full sun all day or at least for six hours. More sun will produce more flowers. As the weather warms up, a tropical hibiscus needs more water and should not be allowed to dry out completely. Put a layer of mulch on top of the roots to help retain moisture. Fertilize the hibiscus every two weeks. Use a water-soluble fertilizer in combination with a slow-release kind. Use a lower-phosphorous fertilizer (with a lower middle number). Remove faded blooms and spotty leaves and discard in the trash bin. Water the plant regularly and ensure that it drains well. A morning watering session will allow the excess water to dry off the plant. Avoid watering the leaves as this will promote fungus growth. Pinch the tips of the stems off during the spring and summer to encourage more blooms. This will cause the main stems to branch out into multiple stems. The hibiscus should produce blooms on all of these tips. 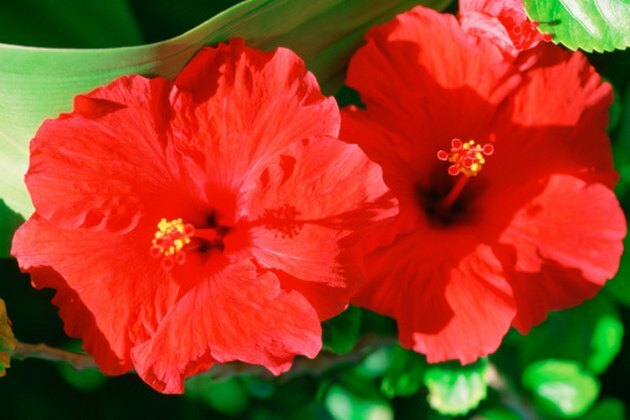 Place your hibiscus in a shed, basement or garage before the first frost to prevent it from freezing during the winter if you expect the weather to drop below 32 degrees Fahrenheit more than once or twice. The goal is to have the plant survive. It will lose leaves and will not flower during this time. Water it a bit once a month to keep the roots somewhat moist. Jennifer Lee is a native Virginian who started writing professionally in 1991. She has written for the "Radford News Journal" and "Albemarle Kids." Her work has also appeared in various online publications. Lee earned a Bachelor of Science in psychology, and a Bachelor of Arts in English from Virginia Tech. When Are Hydrangeas in Season?